It was Friday afternoon in Shanghai – the largest city in China with a population exceeding 20,000,000 – and rush hour traffic was in full force. In my taxi, I was observing how drivers fought for every square inch of pavement in an effort to make slow but steady forward progress. However, no one ever makes contact, at least not as far as I can tell. In my whole time there, I never witnessed a single sideswipe or glancing blow – it’s amazing, really, how so much iron and steel can squeeze through the streets of old Shanghai without so much as a scrape or a small dent. 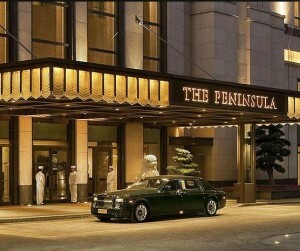 After about 45 minutes or so, I arrived at “The Pen” – the Shanghai Peninsula Hotel, located right on the historic Bund and facing the river. It was quite an adjustment to step off the crowded Bund and into The Pen where it was, all-of-a-sudden, quiet and serene with string (violin) music playing from the mezzanine above. It was remarkable, really, how different it was inside the hotel – an oasis, if there ever was one. From the moment you walk in, you know you’re in a Peninsula Hotel. The staff is impeccably dressed, gracious, and focused on you. You just know that you’re going to be in good hands from the moment you arrive. 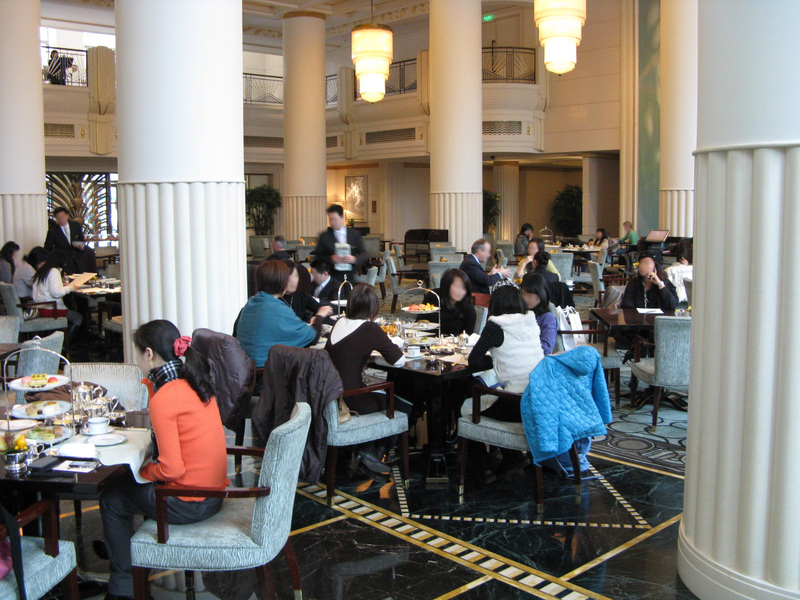 Just like the Peninsula Hotel in Chicago, afternoon tea in the Shanghai Peninsula Hotel is served in a large, airy, high ceilinged room located just off the lobby area. The copious amount of natural light and the live string ensemble promote a casual and relaxed feeling. The Afternoon Tea Menu, which is written in both Mandarin and English, was presented to me and included a traditional English-style Afternoon Tea and a “Naturally Peninsula Tea.” This second option is geared more toward lower fat food choices. For tea, the menu listed classic teas like Assam, Darjeeling and Earl Grey, but also offered a Chinese tea selection, an organic selection, herbal infusions and the Peninsula Signature Hot Chocolate. I chose the Pu Er from the Chinese category, which the staff advised me was grown in Yunnan Province in Southwestern China. It’s a strong, earthy, robust tea that was perfect for this cool February day in Shanghai. After the three tier tray arrived, I was reminded again of one of the things that makes afternoon tea at The Pen so different and special – the artistry and effort put forth in the preparation of the savouries and sweets. Afternoon tea here is not an “accommodation” for hotel customers but an event that is discharged with the highest level of service and attention to detail. The scones, tea sandwiches and sweets were not only pleasing to the eye, but were equally delicious and reflected the emphasis that is placed on this tradition. The apple scones were served warm and had to be so fresh that they nearly crumbled in my hands. Condiments served with them were the traditional lemon curd, strawberry jam and clotted cream. I could have stopped right here and been very happy, but there were some interesting tea sandwiches to investigate. Without a doubt, my favorite sandwich was the citrus prawn salad with fennel slaw on a brioche roll – absolutely outstanding, light and mouth watering. The chicken salad, pastrami smoked salmon and onion quiche with black truffle weren’t too shabby either – all fantastic examples of the culinary skills of the kitchen staff. When something tastes as good as it looks, all the planets line up and everything is right with the world. It was interesting to me that up until recently, I had not had a single shrimp or prawn-based tea sandwich served to me at an afternoon tea, and I’ve recently had two – here in Shanghai and also at the Sofitel– The Grand – in the Netherlands. On the upper tier where the sweets resided, the clear winner – for me at least – was the banana lime entremet. It was not only a thing of beauty, but tantalizingly delicious as well. It’s a layered dessert that kind of reminds me of a mille feuille, though in miniaturized form. The coffee éclair and the orange florentine were also very good dessert items. The service is just what you would expect at a Peninsula Hotel – it exceeds your expectations. They’ll engage you if you like, or leave you alone, if that is your wish. It was amazing that one of the young Chinese staff, upon learning I was from Chicago, informed me that he was a Michael Jordan fan and now also follows Dwayne Wade of the Miami Heat. There are about seven thousand miles between Shanghai and Chicago, but for that moment in time, we may as well have been neighbors. 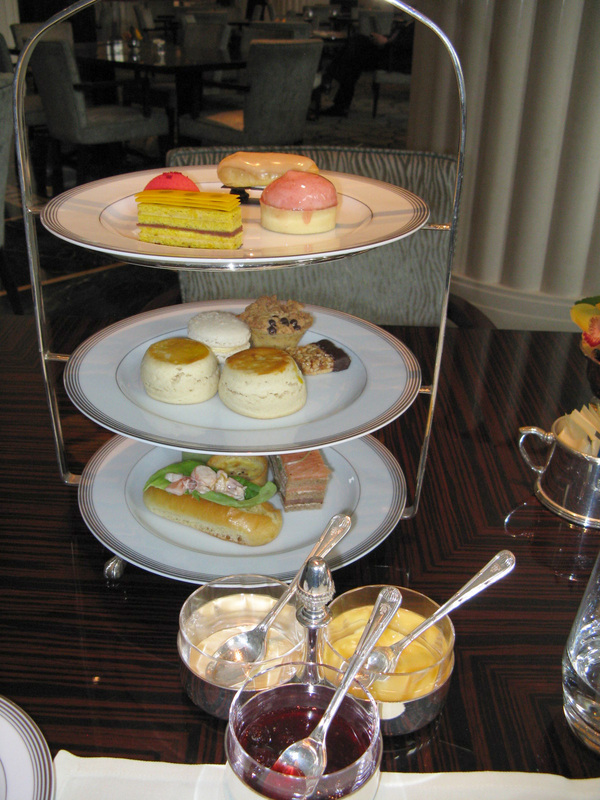 This entry was posted in Asian/Pacific Teas and tagged afternoon tea, china, high tea, peninsula hotel, shanghai. Bookmark the permalink. Nice write up. 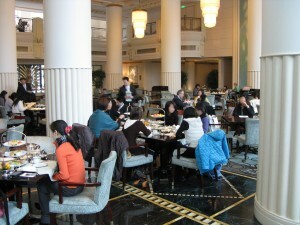 Which is your favorite “afternoon tea” in Shanghai? Without a doubt, “The Pen” or the Peninsula Hotels all over the world do a uniformly spectacular job with afternoon tea.